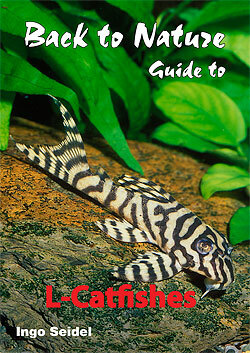 Search Guide: use the Back to Nature L-catfish data base and find out which catfishes that will suit your aquarium. Chapters: What are L-number catfishes?, What should I bear in mind when buying loricariid catfishes?, How can I tell the sexes apart?, What is the natural habitat of these fishes like?, How are these fishes collected and how do they reach us?, What points are important for maintenance in the aquarium?, How can I feed these catfishes correctly?, What are the commonest diseases of L-number catfishes?, How do L-number catfishes breed in their natural habitat?, How can I breed these catfishes in the aquarium?, What will I require for the rearing of loricariid catfishes? Genus descriptions: 38 different genera are described according to the following criteria  number of described species, characters, sexual dimorphism, distribution, diet, maintenance in the aquarium. Species descriptions: App. 390 species (nearly all that are available in the trade) + photos on colour varieties. Each species is described with photo/photos, scientific name, L-number, difficulty to maintain, maximum total length, minimum length of the aquarium, diet, suitable temperature, suitable pH, current water necessary or not, demand of wood etc.. Published in: English, German, French, Dutch, Swedish, Norwegian, Danish and Finnish. Description: The armoured catfish family (Loricariidae), with more than 700 described species, is one of the largest and most varied groups of fishes known to Man. Until a few years ago these catfishes played only an insignificant role in our aquaria, but nowadays they have become the height of fashion. Since the latter part of 1988, when a number of new and sometimes exceptionally colourful loricariid catfish species were first imported, a real catfish boom has sprung into life. Around 500 species new to the aquarium hobby have been imported, and these sometimes vary quite significantly in their requirements. The object of this book is to provide both beginner and more experienced aquarist with an introduction to not only the maintenance but also the breeding of these fishes. It covers some 390 of the most important and most interesting L-number catfishes, listed alphabetically by genus and species, and illustrated in full colour. The book uses easily understood symbols to provide details of eventual size and maintenance for each species, and is illustrated with more than 640 colour photos. 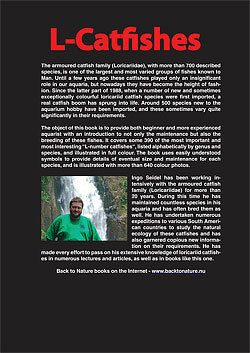 Information about the author: Ingo Seidel has been working intensively with the armoured catfish family (Loricariidae) for more than 20 years. During this time he has maintained countless species in his aquaria and has often bred them as well. He has undertaken numerous expeditions to various South American countries to study the natural ecology of these catfishes and has also garnered copious new information on their requirements. He has made every effort to pass on his extensive knowledge of loricariid catfishes in numerous lectures and articles, as well as in books like this one.